Boom kids orange custom sunglasses goes the hearts go boom with joy with its incredibly crazy color profile. This custom sunglass makes one refreshing gifting favor for all those parents and caretakers who are trying to win appreciation of their little guests. Also, its makes one funky, yet overpowering gift during summer weddings or orange themed weddings, where people wish to peak on fun meters. 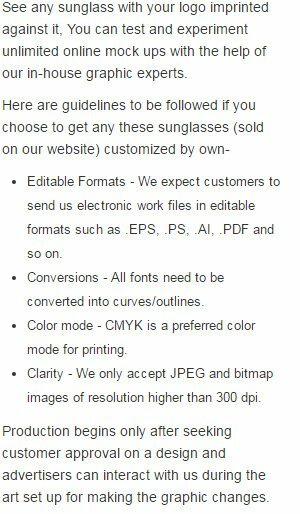 You can avail huge discounts by ordering this hot summer party favorite imprinted sunglasses in bulk. It will help to retain the warmth in relationships for long time. Highlights –4 -Color process highlight. Colorful boom imprints. Orange sunglass frames.